I'm so excited to announce the second part of the Glamorous Gifts Giveaway - a pair of faux leather oxblood leggings from My Empiricist. Ignore the eerie name and add to this to your line-up this season. The color adds a seasonal richness and feels infinitely more appealing than our go-to shades of black or gray. The styling options are limitless. Combine these leggings, a peplum top, and matching dark red lipstick for the perfect outfit for a dinner date with your significant other or to the club with your girls. Read below for giveaway guidelines. To enter the giveaway, follow the simple guidelines below. 2) Follow @MiaTheBoss and @MyEmpiricist on Twitter. 3) "Like" Diary of a Fatshionista and My Empiricist on Facebook. 4) Follow @thefablifeofmia and @myempiricist on Instagram. 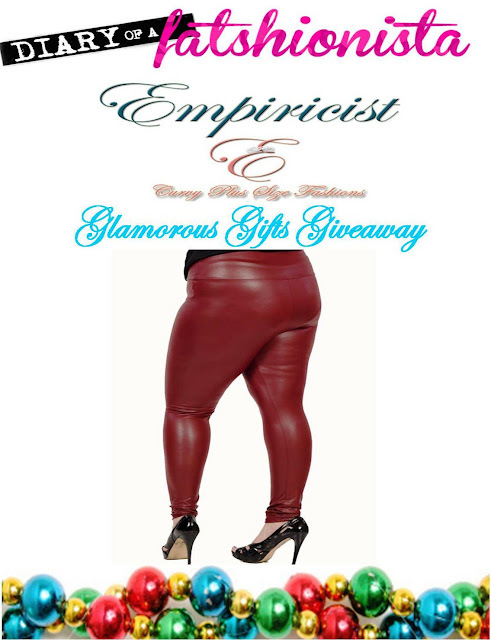 5) Tweet the following: "I just entered Diary of a Fatshionista's My Empiricist giveaway. Visit diaryofafatshionista.com for a chance to win & follow @MiaTheBoss!" 6) You must leave a comment with your e-mail address stating you've done the above. Leggings are available in sizes 1X - 3X. If you screenshot the promo pic on Instagram use hash tag #GlamorousGiftsGiveaway. I will choose ONE fabulous lady at random! You must follow all contest rules in order to be eligible. One entry per person. Duplicate entries will be removed and disqualified. Contest open to United States fatshionistas only. The contest ends Saturday, December 22, 2012 at 11:59 PM EST. Winner will be contacted via e-mail! Good luck ladies!